The ESP8266 chip provides an easy and inexpensive path to the Internet of Things (IoT). My first IoT project is a work in progress, but you can see some early results now. 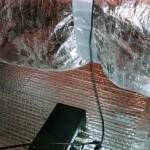 My objective is to monitor the temperature and humidity in my attic to see how effective the roof ventilator is in the summer and to check on freezing conditions in the winter. As with most projects, scope creep immediately set in. 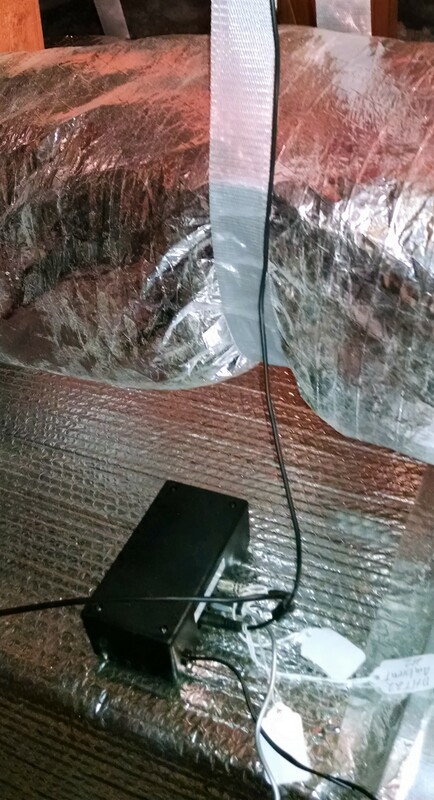 A heat pump installed in the attic provides the heating and cooling for the second floor of my house. It was a nice challenge to add monitoring of the air flow into and out of the heat exchanger to check on its operation. The monitor posts the temperature and humidity data to ThingSpeak where the data is stored and analyzed. The monitor includes a small lithium cell charger for battery backup in the event of a power failure. 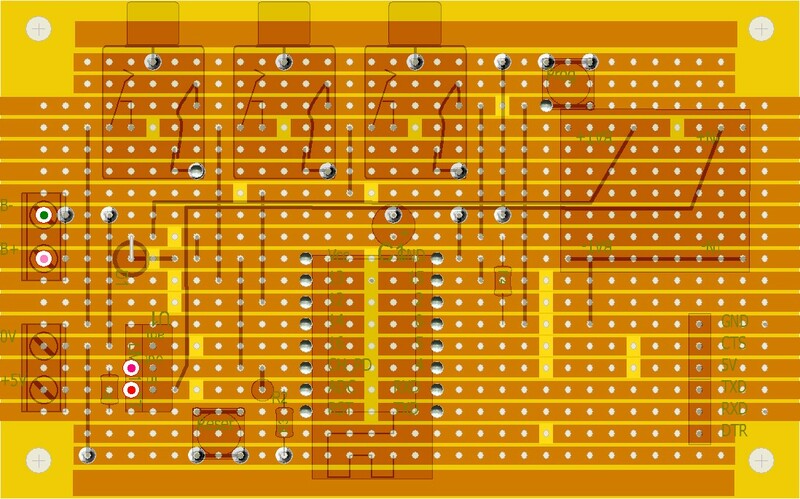 I used Lochmaster 4 to lay out the stripboard. This is really easy to use software and is much better than any of the freeware alternatives on the Internet. A limited demo version and a free file viewer are available from the developer ABACOM Ingenieurgesellschaft at http://www.abacom-online.de/uk/html/updates.html. The schematic is drawn using the free software from ExpressPCB. Download it at http://www.expresspcb.com/expresssch. The ESP8266-12 has pin spacing of 2.0mm making it inconvenient for solderless prototyping boards and stripboards. Most of the adapters available take up a lot of space for no good reason. 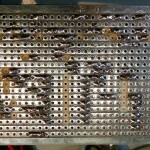 I chose to carefully solder wires into the terminal holes and spread them to 2.54mm (0.1-inch). 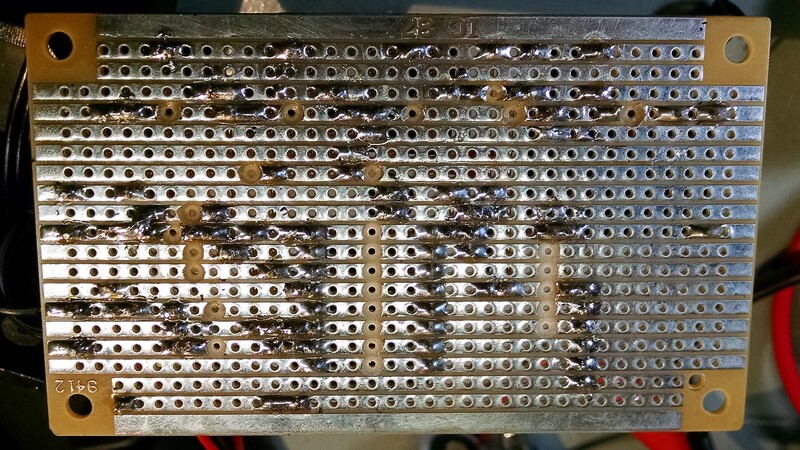 This is tedious but works: cut #26 tinned bus wire into 16 pieces 0.75-inch long and insert them into a wireless proto-board in a 7 by 8 arrangement. Then, with some patience and difficulty, thread the wires through the holes on the ESP8266. Press down on the ESP8266 and solder the wires to the module being careful not to use too much heat or you may melt the proto-board. Cut off the wires on the top side. The hobby market for the ESP8266 is responding with a number of 2.54mm-friendly designs. If I were to make a new unit I would probably choose the DoIt ESP DEVKIT. Most functions work without modification. On exception is that the DEVKIT has its own scaling for the analog input so that part of the circuit would be have to be changed. 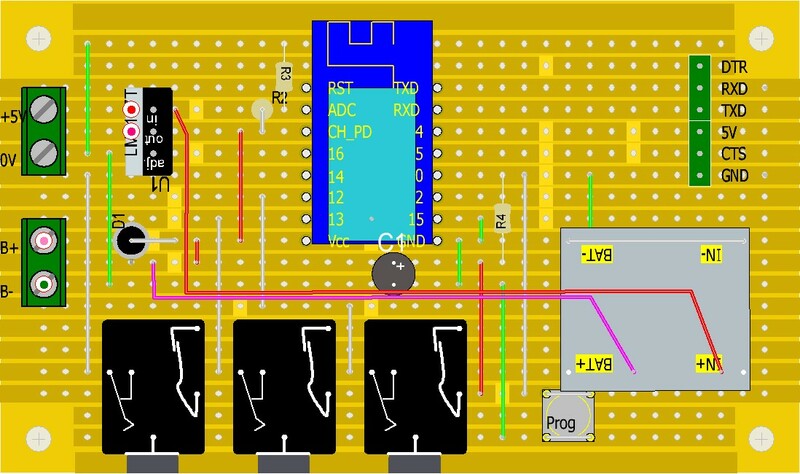 The analog to digital converter (ADC) for the ESP8266 works over the range of 0 to 1 Vdc with 10-bit resolution. The standard resistor values of 68K ohms and 22K Ohms give a scaling ratio of 4.091:1. With 10-bit resolution (1024 steps) this works out to almost exactly 0.004 V/step. An excellent tool for calculating resistor dividers is available as an online calculator at http://jansson.us/resistors.html. Remember to subtract 1 from the desired voltage ratio. For example, to scale a 10-volt signal to 1-volt (10:1) the resistor ratio is 9:1. The calculator suggests one 18K resistor and two 1K resistors in series to exactly give the desired ratio. I had only two DHT22 sensors when I built the unit so the third sensor is a D18b20. The DHT22 sensors read both temperature and humidity while the DS18b20 reads only temperature. The DHT22 datasheet says they work over the range of 3.3V to 5.5V but they get flaky just above 3.3V. The DS18b20 reliably works down to 3Vdc. The DHT22s also showed a strangely periodic loss of signal. Others have reported the same thing. Despite correcting the DHTxx library code I continued to get errors, My code includes routines to read the signal up to three times, if needed, at 2-second intervals. This totally eliminated the sensor dropout, however, the cheap 3.5mm TRS connectors often go open circuit. Light sanding and liberal use of contact cleaner seems to have that under control. Nevertheless, the code contains routines to report the loss and recovery of sensor signals to the ThingSpeak status channel. Tayda Electronics has several sizes of tinned and untinned stripboards. The untinned boards should be carefully sanded with non-conductive paper to remove oxidation. The tinned boards do not have this problem but the reflection from the traces can make it difficult to work with the boards. In the end, it is a personal preference to use one or the other. I use a 7/64-inch (3mm) bit in a small hand drill vise to cut the traces at the holes. The silicon diode between the Lithium-ion cell and the 3.3V bus provides a more-or-less fixed voltage drop of 0.65V. During charge, the cell voltage can reach 4.2V and that would damage the ESP8266 if directly connected to the cell. My unit has not been damaged by the resultant 3.55V after the diode drop. 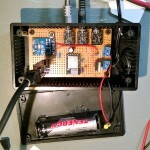 There are good instructions for installing the ESP8266 add-on to the Arduino IDE at https://learn.sparkfun.com/tutorials/esp8266-thing-hookup-guide/installing-the-esp8266-arduino-addon. These instructions use Arduino IDE 1.6.5. Initially, subsequent versions of the IDE did not support the ESP8266 add-on. That seems to have been corrected and the following code was compiled and tested with 1.6.7. 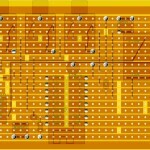 Check https://github.com/esp8266/Arduino for the most recent versions of the ESP8266 core. Use the instructions for installing with the board manager. The Over-The-Air (OTA) update capability is a great feature especially if your unit is located in a remote or inaccessible place (like an attic!). A good way to learn how to use OTA is to run the BasicOTA.ino example under IDE menu Files|Examples. // Loop until the transmission interval has passed. // avoid using delay() because it blocks other functions. // if reading is bad (not a number) then wait 2 seconds and check again. // quit after three attempts. // this seems to be a problem with DHT22 (AM2302) sensors. From time to time you may see one of the temperatures go to 0C. This is due to a poor connection to the sensor. I used the cheapest 3.5mm plugs I could find and now regret the choice. The plugs hardly go a week without an open circuit. I’m looking for a more secure and reliable connector such as used on the Grove system but easier to apply. Suggestions welcome. This seems like a great IOT project. I have almost the same setup but with 3 DS sensors instead. Your code seems simple enough to be easily modified for my sensors instead. I do not only monitor temps but actually controlling the fan as well so I compare 2 temps and if 1 is higher, fan is on, if not it is off. The DS sensors are accurate and reliable. The DHT22 sensors are not. I plan to replace the ambient sensor with a BME280 and use DS18B20 sensors for the inlet and outlet air. It hasn’t been necessary to monitor the fan directly as its operation shows up pretty clearly in the difference of the inlet and outlet temperatures. In my case it is a DIY Solarheater (air) on my garage. The controller compares indoor temp with “heater-temp”. If air in “heater-temp” is hotter than indoors, the fan starts. The 3rd sensor is used for ambient temp. My goal is to send data to thingspeak . com to get a graph of temps. Right now the issue is my programmer that is not up to the job.